With heavy rains lashing misery across parts of India many states are reeling under flood like situation. Bihar and Assam are among the states which are badly affected and need urgent relief measures. Believers Church is working towards helping and rehabilitating more than 9700 families in the affected regions. 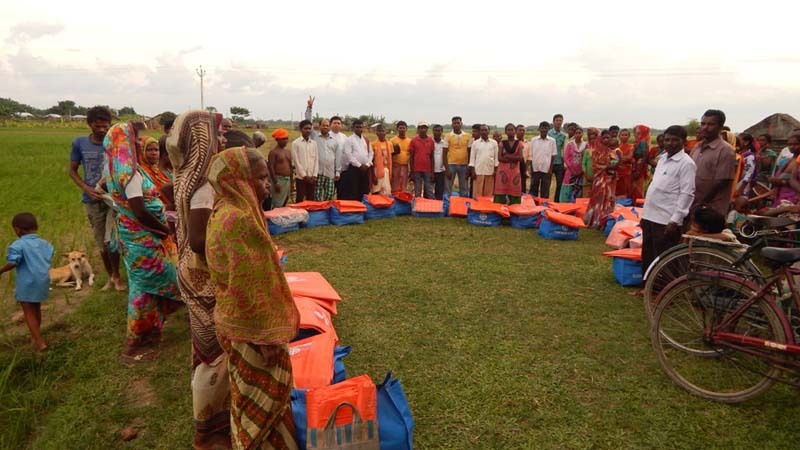 In the first phase, the Church reached out to the 800 most affected families in the four districts of Kishaganj, Araria, Katihar & Purnia of Bihar. The relief measures for these families were carried out from 4th - 6th August wherein these families were provided with dry food items packs containing Satu (lentil powder), Chana grain (lentil), Jaggery, Bread & other eatables. Besides, the volunteers of the church are also helping rebuild physical infrastructure for the affected families and supplying free tarpaulin and other relief material. In the second phase Believers Church Patna diocese is planning to conduct relief works for 3200 more families in the 6 affected Districts. Believers Church has earmarked Rs. 50 Lakh for the flood affected areas of Bihar. In Assam, Dhemaji is one of the worst affected districts and as per reports by the district authority, an estimated 1.5 lakhs people are affected under Dhemaji district. 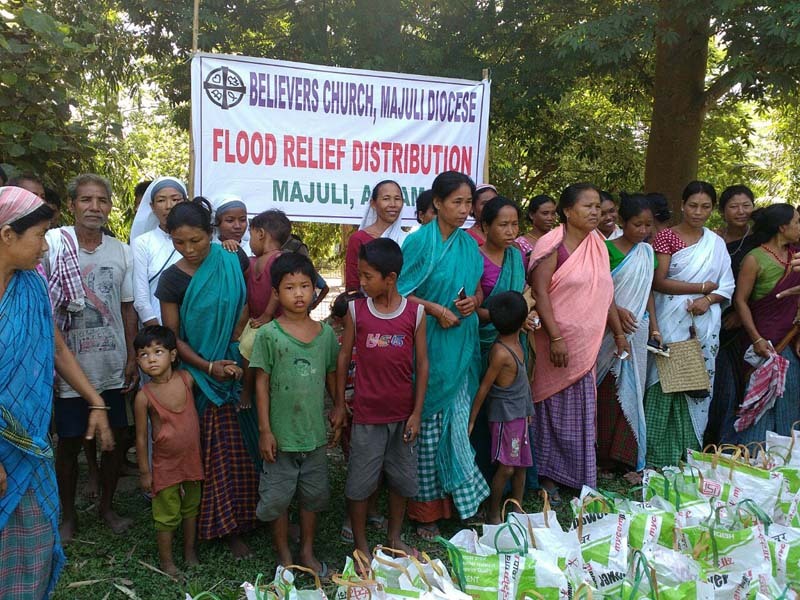 Seeing their plight and misery Believers Church has extended help to 5700 families of the flood affected Dhemaji District. Believers Church Dhemaji Diocese distributed over 1000 Mosquito nets, and items like Beaten Rice, Boiled Rice, Biscuits, Soap, Toothpaste, Toothbrush, oil, Gur worth Rs. 15 lakhs to the needy families. The team also distributed 600 blankets to the affected families of this region. Believers Church team also visited Khapu Chapori Island, the worst hit areas under Dhemaji district and met the authorities to extend all possible assistance to the affected people of the region to rebuild physical infrastructure. From July 2016 till now, Believers Church team headed by Bishop B Sunder Raj with few district officials - DC, BDO, Circle Officer, Few District Medical Officers, District Veterinary officers, District Agriculture officers, Jila Prashad President, Goan Panchyat President and others along with the help of district authority Dhemaji, has visited 6 relief camps under Jonai Sub-division and other places across Dhemaji. Speaking on one of the Occasion Shri Victor Carpenter, the Deputy Commissioner expressed his gratitude to Believers Church for their support to the needy people. At another time Shri Dharamprasad Mili of Demaji, ADC inaugurated the relief camp. The Church’s numerous other programmes have benefitted thousands of children, women, leprosy patients and villagers in the form of education, counselling, health camps, medicines, hospitals, shelter, rehabilitation and clean drinking water. Believers Church is a Christian denomination with congregations and parishes worldwide and over 2.6 million followers in 10 countries. The Church at present has eleven Bishops who give spiritual and administrative leadership to the various activities of the Church. The current head of the Believers Church is Metropolitan Bishop, Dr K. P. Yohannan. 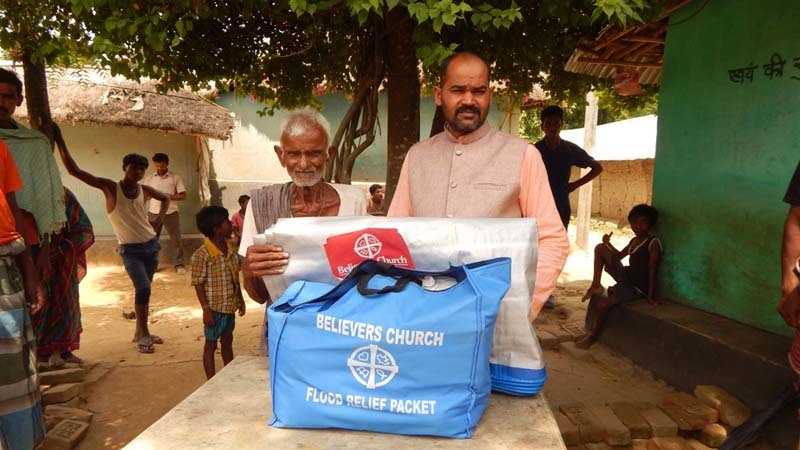 Believers Church Patna diocese team along with the local government and civic authorities are working rigorously and are setting up relief camps to safeguard families of the affected region. The church also undertakes various charitable programs including women empowerment, educational projects, community development programs, rehabilitation projects and relief works. Believers Church has helped over 80,000 children by providing quality education and timely medical checkups under its Bridge for Hope Program. Believers Church has set up more than 28,000 toilets and has committed its resources to Prime Minister Narendra Modi to help educate people on sanitation under the Swatch Bharat Program. Vocational Training and Health awareness programs have been organised for underprivileged communities. The church has conducted eight-month long free literacy programs, to teach the marginalised sections of society how to write and read. The church has provided water to communities where drinking water is scarce by constructing bore wells and community water tanks. The church has given sewing machines, livestock, carpentry tools, rickshaws and agricultural equipments to families to generate regular income. Through the Humanitarian Assistance project the Church has assisted in Nepal earthquake and Odisha Cyclone disaster relief operations through reconstruction of houses, providing food supplies, medicines, water, clothes, mosquito nets, plastic sheets for making tents, hygiene supplies and solar lights.